Some kind of small solace from the rain pelting the East Coast (and Texas, and Minnesota, and the Southeast) is coming on Thursday. Starbucks is handing out free espresso or Frappuccino drinks to relieve you from your end-of-the-week middle-distance stare. On Thursday, September 27, Starbucks' "Happy Hour" is back with a buy-one-get-one-free (BOGO) deal on espresso drinks and blended Frappuccinos, size grande or large. The deal runs from 3pm to close and is good on hot and iced espresso drinks, so you have an option to fit whatever weird transitional fall weather you're experiencing in your part of the country. All three of the chain's fall drinks -- Pumpkin Spice Latte, Salted Caramel Mocha, and Maple Pecan Latte -- are available iced, in case you were wondering. You can also get them in Frappuccino form if you're into that sort of thing. It's a great opportunity to pay back a coworker for that time they forked over a granola bar when you didn't have time to dip out for lunch. Maybe it's a solid excuse to throw back two coffees all by yourself. Or maybe it's your chance to break out of your usual coffee routine and taste something new with less risk. If that's the case, Starbucks announced a particularly interesting new drink alongside the return of the Maple Pecan Latte last week called the Cold Foam Dark Cocoa Nitro, which objectively sounds way more interesting than black coffee. The company describes it as "velvety smooth" cold brew coffee with bittersweet cocoa flavors and "inspired by dark chocolate stout." 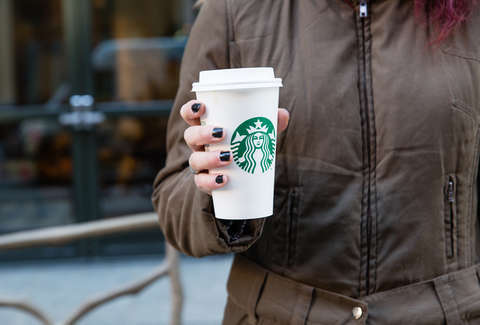 Whatever your motivation, here's how you get in on the BOGO deal: If you're a Starbucks Rewards member, you'll get a barcode in your email and/or mobile app. You can show that to the cashier to get your freebie. Otherwise, you can head to the Starbucks Happy Hour site to RSVP and get your BOGO offer that way. And if you do that, you'll be added to the mailing list to get future "Happy Hour" promotions, which is a good or bad thing depending on your perspective and willingness to have one more email between you and that elusive inbox zero. Just remember that the deal is only good after 3pm and that some locations might not be in on the whole "Happy Hour" thing.